The setting was the annual 9/11 Unity Walk in Washington, DC. on Sunday, September 9. For the 8th year in a row, every church, synagogue, temple and mosque on Embassy Row opened their doors to build bridges of respect for each other and to symbolically give the world a dramatic display of unity in response to the divisiveness and religious bigotry that followed the tragedy of planes crashing into and bringing down the Twin Towers in New York City and a wing of the Pentagon in Washington, DC, on September 11, 2001, resulting in 2,996 fatalities. In a city not known for coming together—at least not politically—the Unity Walk has an impact both locally and beyond. It’s an apolitical event without signs, banners or placards with walkers and worship houses alike often going beyond what is comfortable. One sees and hears things unexpected, like a Muslim call to prayer in a Jewish synagogue, or a Christian choir singing “Amazing Grace” on the steps of the city’s Islamic Center. At each place of worship, guides from that community are available to answer any questions and refreshments are offered. As a result of their experience on the Walk in recent years, a group of teenagers have organized an interfaith youth service. Capital Area Interfaith Friends (CAIF) consists of middle and high school youth who meet regularly for service projects such as preparing meals for and eating with the homeless. In the process, they learn about each other’s faiths and come to see that service and caring for those in need is the heart of all faith traditions. 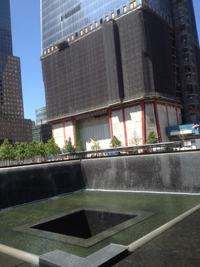 Two towers are presently under reconstruction in New York City flanking a memorial in which water flows down walls bearing the names of those who lost their lives in the 9/11 attack. The water flows down a dark hole in the center and drops out of sight. 9/11 Unity Walk is now broadening its efforts in the area of interfaith youth service. This year, the organization will be helping interested families, faith communities, and schools come together to start their own Interfaith Youth Service groups. Similarly, young professionals in their 20s/30s involved or interested in interfaith work started a multi-faith network last April, holding monthly brown-bag lunches at various non-profit venues. They met with peers who staff many of the local interfaith organizations to explore future collaboration. They call themselves the Unity Walk Peacebuilding Network and offer a chance to hear from contemporaries what they’re facing on the job and to share best practices on subjects like communications and relating to the media. Information about either of these budding organizations is available at director@911UnityWalk.org. Nationally and internationally, it’s a statement of what is possible. There is nothing happening in the DC Unity Walk that could not be done in other cities as well. At the beginning of the Walk, Imam Mohamed Magid from the All Dulles Area Muslim Society provided an example of possible far-reaching effects in saying that Muslim leaders in the U.S., moved by support for Muslims from members of other religions, have visited Egypt to encourage leaders there to respect the rights of Coptic Christians.